Slice 3 eggs in half and remove the yolks. Place the yolks in a food processor or mini chopper. Set aside. Chop up the remaining whites and the rest of the eggs. Place in a medium-sized bowl. Set aside. Place the mayonnaise, mustard and hot sauce in the mini chopper with the yolks. Pulse until smooth. Pour over the chopped eggs. Add the creasy greens and red onion and stir to combine. **I used locally made Snake Oil hot sauce by Woodberry Kitchen which is made with my favorite: fish peppers! As I mentioned in my previous creasy green recipe, creasy greens are a spring green that is often foraged in West Virgina and grows wild in a lot of the south. I think the creasy greens I received must been grown in a greenhouse however, they were super clean; nearly pristine. If you are lucky enough to find some either in your backyard or at the market, pick them up! They have a great peppery, sharp bite to them. 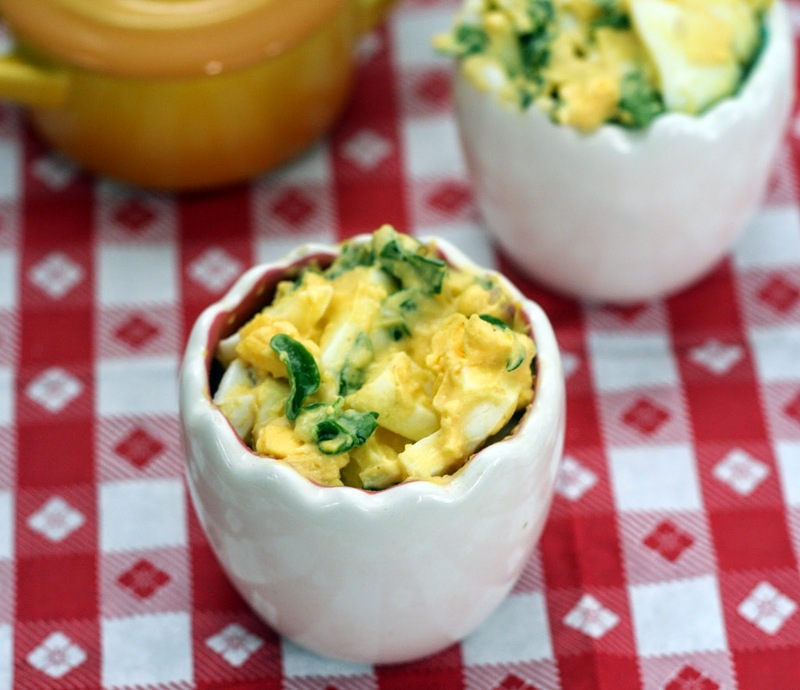 I tempered that bite a bit by stirring them into this creamy, rich egg salad. We had it as part of a dinner I like to call "snackies" (a bit of cheese, a bit of bread, a bit of veg etc) but it would make a fine lunch treat.